Gas prices are already topping $4 in Los Angeles, along with other parts of the country. NEW YORK (CNNMoney) — Gas prices have gained 12 cents this week, astensions over Iran heat up and oil prices keep moving higher. The price of unleaded gasoline shot up overnight by 3.5 cents to a nationwide average of $3.647, according to the motorist group AAA. That’s the 17th consecutive day of increases. Since the start of the month, prices have gained nearly 6%. And they’re up 11% from the start of the year. In many parts of the United States, including New York City and parts of California, gas prices are already above $4 per gallon. 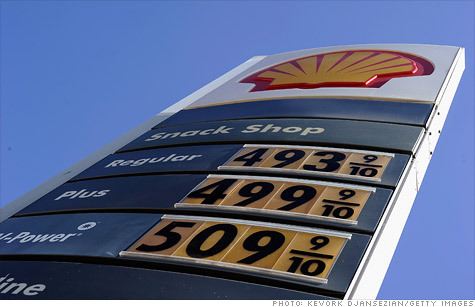 Part of the recent surge in gas prices is being blamed on stocks. The Dow Jones industrial average (INDU) is up 6% from the start of the year. The S&P 500 (SPX) has gained nearly 8%, and the Nasdaq (COMP) has jumped 13%. iReport: What’s the highest gas price you’ve seen? The unrest in Iran isn’t helping, though that tends to have a more direct impact on oil prices. Oil prices have been steadily increasing, gaining 0.4% to $108.26 in early trading Friday. Gus Faucher, senior economist for PNC, said that events in Iran effect gasoline prices though that impact is typically delayed, trailing the effect on oil. “It shows up almost instantaneously with oil prices, and it doesn’t take much longer to show up with gas prices, just a few days,” he said. Iran recently cut off exports to France and the United Kingdom in response to sanctions from the United States and the European Union. Also, theIranians blocked watchdogs from the International Atomic Energy Agency from inspecting a military base in Parchin, creating concerns that there might be nuclear weapons there.